Nightfall had descended down on the sea as Garin made orders to anchor the Black Pawkeet. One by one, as their duties were completed, the crewmen retired to the cabins for the night, leaving their captain and first mate to discuss the issue of their new stowaway in Garin's cabin. "...I simply don't understand how she could have been there for three whole months," said Jacques. "She wasn't. She couldn't have. It's impossible. She was in the hold for merely a few days by the looks of it," replied Garin as he mused and rubbed his chin. "What does she mean by a passion that cursed her? It doesn't make any sense." "Well, Garin, she obviously has gone through a lot and doesn't want to talk about it." Jacques shrugged and set his mug on the nearby table. "Either that or she doesn't trust us, because of who we are. I say all we can do is take her ashore and leave it at that." "No," Garin argued. "Not until I find out why she's here. There's only one way she got here without sneaking onto the Pawkeet at berth..."
Jacques stared at Garin and understood his implication. "The sea..." he whispered. "Aye," Garin nodded. The Usul pondered for a moment in silence when he got up from his desk and started for the door. "Where have you last seen this Jane?" Jacques swiftly followed his mate and blocked his way. "Garin, I don't think we should push the matter." "Step aside, Jacques," Garin said. "I'm going to go find out." "No," the Kyrii replied and crossed his arms. "I'm the captain," said Garin as he pointed at his chest. "I should know why and how she got here." Swiftly the Usul captain whipped around a dumbstruck Jacques and opened the door, allowing the cool night air to flow into the cabin. Jacques blinked and whirled around, grabbing the door as he went and watched Garin's silhouette in the lantern light. "Garin!" he called. He ignored him and continued walking. Jacques groaned and quickly followed him on his tail. "Garin!" he repeated. "This isn't a good idea!" "The only bad idea, Jacques, is not taking action about this stowaway," replied Garin who barely even turned his head over his shoulder. Jacques sighed and rolled his eyes at his friend's stubbornness. He glanced up from his striding to see that his mate had surprisingly stopped just mere feet before him with a hard watch on something across the deck. Jacques crept quietly toward him, but his boots sounded on the wood. "Shh," Garin whispered with a finger over his mouth. "What is it?" questioned Jacques in a murmur. He followed Garin's gaze to see the little blue Aisha girl standing at the deck railing and staring out at the horizon. In spite of the calm night, the ocean waves gently rocked the Black Pawkeet, making Jane's unbearable exhaustion deteriorate. She tried to inhale slowly and deeply, her chest trembling from the strain as she nearly gasped for air. Her head began to revolve, dizzying her senseless. Colors began to playfully dance before her eyes as she lost complete control of her body; and so, Jane fell faint from the ship's sway, tipping overboard into the sea. Alarmed, Garin and Jacques' eyes widened as they gasped. Garin dashed to the deck rail as Jacques met him with a dropped jaw of shock. They scanned the dark rippling waters below, but Jane never resurfaced. The crew stirred below deck and quickly emerged out of the trap door, some being up late and heard Jane's splash. Garin did not answer him as he rapidly removed his weapons, including his maractite sword, and threw off his vest, passing the items firmly to Jacques. "Hold these," the Usul said. "I'm going after her." Without another word, Garin climbed over the rail and dove headlong into the black sea. Jacques stared at the black waters in speechlessness. Talak approached as he speedily handed him Garin's possessions. "Quickly, mates! Grab a rope!" Jacques exclaimed. Though their minds were briefly confused regarding the situation, they obeyed their first mate's orders. Jim scuttled to a hefty pile of ropes as the crew assembled in single file. Anxiously Jacques watched the sea below, his eyes scanning for Garin to resurface. Finally, to the relief of his uneasiness, a head broke the water's surface near the hull of the Black Pawkeet. Needless to say it was Garin's wet face as he gasped for air. "Garin!" he shouted and tossed the rope as it sharply slapped the water near him. "Grab this!" The Usul nodded and tightly grasped the end of the rope with one paw, holding an unconscious Jane is his other arm. "Alright!" Jacques exclaimed, bracing himself in front of his crew. "Pull!" Though Garin carried with him the little blue Aisha, his crew did not falter; and in no time their eyes beheld the sight of their captain climbing over the railing with Jane in his arms. Garin, deeply breathing from the rescue, gently laid Jane on the wood deck as he heard a familiar feminine voice above the crew's conversing. "Move aside! Move aside!" said a lightly tanned yellow Acara with shoulder-length dark hair as she pushed her way through the pirates. Her name was Gwen, the Black Pawkeet's doctor. However, she was very knowledgeable in medicine and well respected by the captain and crew. Gwen dropped down on her knees to where Jane lay and hastily fished out an instrument to monitor her heartbeat. Garin bent down to her level. "Is she alive?" he asked. The Acara paused for a moment then looked up into Garin's concerned blue eyes. "Yes... but barely. She needs a warm place to rest and recover, and there I can help her further." The night was long and unbearably slow as Gwen watched and examined Jane with care, determining that she had fell faint before tripping overboard. Despite the majority of the crew again returned to their hammocks for sleep, Garin remained wide awake and alert, waiting for an update on Jane's healing. Before long, the morning sun's rays of light stretched across the sky and glittered on the sea. Garin watched the golden sunrise intently when he heard the creak of his cabin door open. He looked up to find Gwen walking up to him and wiping her paws on a soft white cloth. They looked at each other. Their eyes were weary and bloodshot from the lack of sleep. "Well, what's new?" Garin inquired. Gwen took a deep breath as if she was amazed and began. "I have never seen a case like this before. She has been through more than we can imagine. It shows on her body that she has traveled for long distances at a time and simply passed out from extreme exhaustion," explained Gwen. "As I examined her, I noticed there were tiny scars on her legs that looked like... scales." "Scales?" Garin narrowed his eyebrows. Gwen nodded. "It means she once had the tail of a Maraquan." Garin displayed a face of shock. "Is she awake?" "She has awaken somewhat, but she is disoriented," Gwen replied quietly, knowing that would displease him for she knew how much Garin wanted to crack Jane's mystery. "She's suffered from severe exhaustion, cap'n. I thought you would presume that." Garin sighed tiredly and ran a paw through his hair. "All I know is that she wanted to go home, to her owner. Nothing more. Except something about being 'cursed by her passion.'" Gwen paused in deep thought then spoke. "I will take you to her." Surprised, Garin followed the Acara doctor as they walked to his cabin and opened the door. Garin stepped inside as he looked at the blue Aisha resting on his bed. "If you wanna find out more about Jane, Garin, it will have to be now," Gwen said. "Aye," replied Garin. Gwen sensed Garin wanted to be alone with the Aisha; and so, she quietly closed the door behind him, leaving him in the silence. Garin instantly noted the young Aisha's fatigue, knowing she would have drowned if he had not rescued her. "Jane," he whispered. Jane did not blink nor shudder at the sound of his voice. Carefully the Usul crept to her bedside and louder repeated, "Jane." Garin caught the motion of her eyes fluttering as she slowly awoke. They were bloodshot and heavy as she gazed sleepily around the room until her blank stare landed on Garin. "W-What happened...?" Jane murmured weakly. "You fell overboard," Garin answered directly. "And I rescued you." "You... you saved my life...?" "Yes." Garin nodded as he glanced over his shoulder at an old wooden chair placed in the corner of the room. He grabbed it and scooted it to the bedside and sat down. Jane watched him and he keenly saw the apprehension embedded in her features. In the blink of an eye, Garin unexpectedly grabbed Jane's bed sheets and flung them aside, looking down at the scale-like scars on her bare legs. The Aisha gasped and grabbed the blankets, promptly covering herself as she glared up at Garin. "What was the meaning of that?" "You were once a Maraquan," Garin said quietly. "No!" Jane refused. "I was not, I am not, and will never be a Maraquan!" "Jane, it's useless to try and hide it," said Garin as he sat back down in his chair and tightly crossed his arms. "And if you ever wanna see your owner again I suggest you start explaining, or else you'll be on my ship forever." "How am I supposed to trust a pirate like you?!" Jane exclaimed. Garin paused for a moment when his agile mind began working up an idea. He cocked his head and sighed, allowing a few seconds of silence to hover over them. Cleverly he mused as he rubbed his chin. "You're right. How can you trust me?" he said quietly. Jane stared at him intently as he stood up and began walking toward the door, seemingly defeated. "Where are you going?" she asked curiously. Garin didn't answer her question and simply gazed back at her. He shrugged. "If you can't trust me to take you back home, then I guess you have no other choice than to stay out at sea for a few more months." The Usul slowly turned the doorknob to exit the room when he heard Jane cry, "Wait!" Garin stopped as he smirked in success. The captain faced back to Jane as her big eyes gazed at him pleadingly like an innocent child. He saw her sparkling tears as one trailed down her cheek. "I ran away from home a year ago to be in the sea forever. I thought it was my one wish, the only thing I ever would desire, but I was wrong..." Jane cried. Hours ticked away on the clock as Jane told Garin her long, woeful story of how she commenced a carefree, blissful life with her blessing of fins; and then, as months passed, her days turned into a painful horror. Homesick and longing for her legs again, she sought for Nereid, who had given her her Maraquan tail, but she had forgotten that the transformation was permanent, and she had not the power to restore for her a life on land. "Nereid sent me to a water faerie named Yara, and in short, after a torturous journey, I arrived there, and I once more traded something I had for something I desperately longed for," Jane continued. She sniffled from the tears she shed. "I came aboard your ship through the porthole of the cargo hold and remained there for three days, enduring the throbbing of new legs until your crew found me." Garin set back as he angled his chair with his weight, contemplating about Jane's fascinating story as pity and compassion shone in his blue eyes. "Abigail hates the sea," Jane said. "She never would come out here to find me. 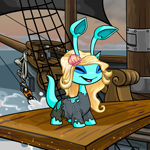 She's probably forgotten about me and replaced me by now with another Neopet. She might have even moved away from the sea as well!" "Well, that's it then," Garin concluded and rose from the old creaky chair. "You're going home." "I don't think I can now. I'm not sure if I have the courage to go back or not," replied Jane. "You have to. You have run away for so long, Jane, that you have nowhere else to go." "But what if Abigail won't be there? Then what am I to do?" asked Jane sorrowfully. "I can't tell you what to do, Jane. You gotta decide that for yourself," Garin answered sincerely. All of the sudden, a distant yet thunderous boom echoed, causing Garin to become instantly alert, recognizing the sound as cannon fire. Garin felt his heart race as he grabbed his maractite sword that lay on the table and sheathed it at his side. The door then swung open as Jacques entered the room panting heavily with alarm in his brown eyes. "Captain, the lookouts have spotted sail on the horizon," he reported. "Whose sails?" Garin asked curiously. "Scarblade?" His Kyrii mate shook his head, making Garin's eyes widen in shock. "We don't know who, but they hoisted a black sail." "Then it's time to hoist ours as well," Garin answered deeply with narrowed brows.